Hey parents! Have you been wondering what goes on in KidzWorld? Well now’s your chance to experience KidzWorld alongside your child! You asked for it and here it is – introducing Parent Month. You’ll have the opportunity to follow your child into KidzWorld for a first-hand account of what your kids are learning. As we are limited on space, we will only be able to accommodate a limited number of attendees each week. 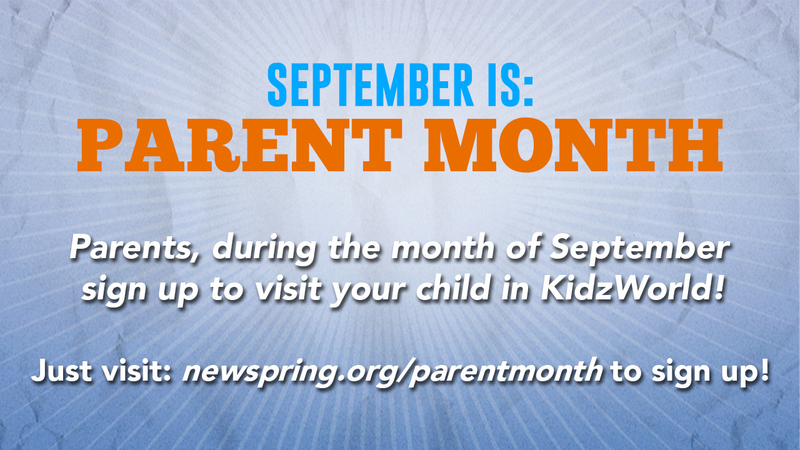 If you’re interested, be sure to visit newspring.org/parentmonth and select a date and time that will work for you. Please be sure to register every person who will be attending with your child, but please limit it to two attendees per child. We would also like for you to be able to attend your usual service in the auditorium. To do this, just tell the volunteers at the check-in stations that your child will be attending two KidzWorld services. We are excited for this opportunity to get to know some parents we haven’t met, and we hope that you are one of them. Sign up now by clicking HERE.